Located in the heart of downtown Hopkins, Hopkins Health & Wellness Center has it all under one roof. Physical therapy, medical, chiropractic, massage therapy, acupuncture and even a community fitness center. 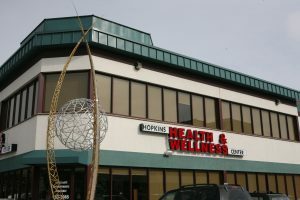 In addition to all their health and wellness services, Hopkins Health & Wellness Center is an important part of the Hopkins business and civic community. In addition to participating in community events every year, the team at Hopkins Health & Wellness Center has established a Community Wellness Program that focuses on doing things in the community that support healthy lifestyles. 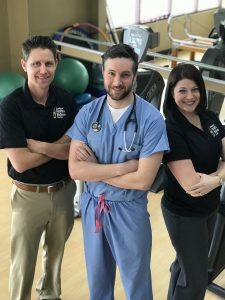 Our team of knowledgeable and experienced physical therapists and chiropractors, with the help of some allied medical providers, developed the first standardized protocol of evaluation and treatment for the spine that combined physical therapy, chiropractic, and medical treatment. We reviewed research from all over the world, met with multiple spine care specialists and surgeons, and spent countless hours identifying key factors in nonsurgical treatment fo complicated spinal conditions. We synthesized all that information to refine and continually improve this nonsurgical protocol, which we called the DMR (Diagnose, Manage and Rehabilitate) Method. After our initial successes with the DMR Method, one of the largest diagnostic imaging groups in the country offered to help us do a study utilizing pre- and post-MRI scans. We began with a pilot study that included twenty patients. Based on the outcomes of that study, we refined the DMR Method evaluation and treatment protocols and began the first DMR Method clinical case study. That study, completed in 2010, was one of the only clinical case studies of its kind in the country and was a rousing success. We now had proof that we were successfully treating cases that were previously thought to be treatable only by surgery. Our research caught the attention of KARE 11, an NBC affiliate in Minneapolis, and they invited Dr Pete L’Allier from our clinic to have lunch with Dr. Mehmet Oz, star of the syndicated Dr. Oz Show. In that meeting Dr L’Allier explained the DMR Method, the research we were doing, and the amazing results we were seeing. 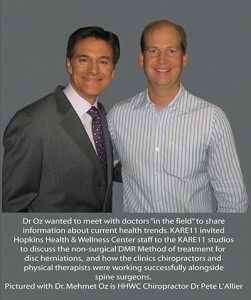 Dr Oz was impressed with the work we had done and explained that healthcare providers and the public they serve need to become more aware of non-surgical options like the DMR Method. Based on the meeting with Dr. Oz, our team to produce to produce a book—not only to educate healthcare providers and patients, but also to create a practical resource for patients to use while receiving treatment. The result was two books: The DMR Method: Advanced Nonsurgical Care for Neck and Back Pain, and Wellness for Everyone: An Innovative New Approach to Living a Healthy, Happy and Balanced Life. Over the next few years we continued our clinic work with patients and research to further develop and refine the DMR Method. Part of that evolution with the opening of a credentialed post-graduate school called DMRU. DMRU is dedicated to providing continuing education for healthcare providers that supports collaborative, nonsurgical treatment options for patients. Hopkins Health & Wellness Center has grown to be the hub of growing network of DMR licensed clinics in the state of Minnesota. At Hopkins Health & Wellness Center, we love our patients AND our community! We developed a “Community Wellness” program that supports many important projects, the arts and traditions of Hopkins. From sponsoring various community events to creating the Wellness Monument and World’s Largest Raspberry sculpture, Hopkins Health and Wellness Center has left it’s charitable mark on the Hopkins community. To acknowledge their commitment to the Hopkins community, Dr Pete L’Allier from Hopkins Health & Wellness Center was appointed Grand Marshal of the 2018 Hopkins Raspberry Festival. We’d Love to be Your Team! We’re proud of what we created in Hopkins and love to give people tours of our dynamic facility. 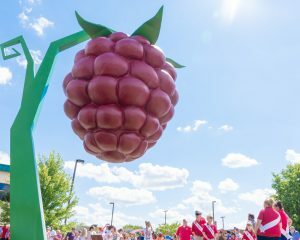 All you have to do is stop by and we’ll give you a grand tour that ends with a visit to the World’s Largest Raspberry!